The QuadCross MX PRO is designed specifically for very hard-packed, blue-groove type motocross racetracks. The QuadCross MX PRO utilizes designs that have resulted in significantly better performance than the original QuadCross MX tire. A revised shoulder profile greatly improves cornering predictability and side bite, while a specially formulated soft rubber compound finds traction for excellent acceleration and braking on the slickest of surfaces. 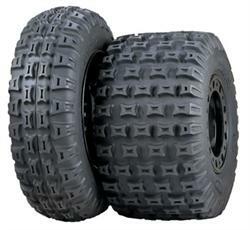 Sizing: 20x6-10 Front; 18x10-8 Rear. New 18x8-8 Rear QuadCross for smaller sport ATVs now available.